Another danger is that it’s so concealable. You could EASILY slip that magazine inside a 8ft bamboo shoot and stroll around in public, without anyone having any idea. That’s scary. Also, as it was pointed out on facebook, we need to ban high capacity assault ladders. 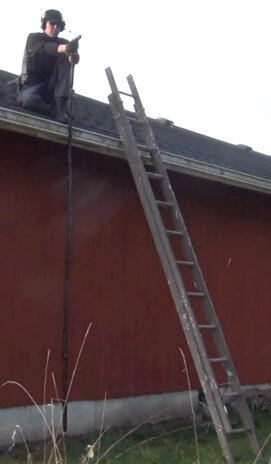 There is just no reason a ladder should have over 7 rungs. You take the ladder out of the equation and the shooter is forced to use stilts, which will likely make them an easier target for good samaritans to knock over and save innocent lives. And to think, days ago I was only worried about the 64 round high capacity assault magazines. The only problem I see is that representatives don’t actually read the mail and the dumbfuck staffers might pass a pro-ban advisement on to the Rep.
Well, as a “dumbfuck staffer” I take exception to your comment. -No one reads mass, form emails (although the volume is recorded) however, a well thought out message will find it’s way to a members eyes. There are probably people out there that think this would work. What a beautiful write up :) Thank you, ENDO-MIKE. You’re welcome. Thanks for the great video! This is so funny. I’ve watched it 3 times and can’t stop laughing at the “600 round glock assault clip.” I hope he makes more of these, making fun of each in accuracy in the media. More vids coming :) Few serious vids and some more funny vids in the near future! Worst thing is that those clips are easily converted into fully-automatic clips which are the most dangerous clips of all the clips. And you cannot tell me you need this clip to hunt deer — unless there are like 600 deer. Gun X Sword (an Anime) has a character named Ray Lundgren that uses a machine pistol with a magazine so long that it looks like a sheathed sword until he whips it out. I supouse you could make a 64 round magazine and holster it in your belt, but you’d be flagging f***** everyone when you walk around. Did you say “Troll Successful” and flash him a sideways troll face grin?